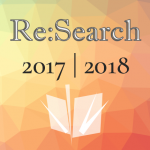 Re:Search, the Undergraduate Literary Criticism Journal at the University of Illinois, is seeking submissions for our 2015-2016 edition! If you are interested in submitting a proposal, please attend our first Proposal Workshop on October 9 from 5-6 p.m. in room 104 of the English Building. We will be going over the format of the proposal, doing a brief workshop on drafting a prospectus and what makes a strong thesis, and offering examples of proposals that made it into the journal. On October 23 from 4-5 p.m. in room 304 in the English Building, we will be hosting a second workshop to go over submitting proposals to our online journal. We will register you as an author and train you on how to navigate the online journal system (OJS). Instructions on how to register for those who cannot make it will be provided. Download our Call for Proposals here or visit the Call for Proposals page to learn more. Email uiuclitjournal@gmail.com with any questions!